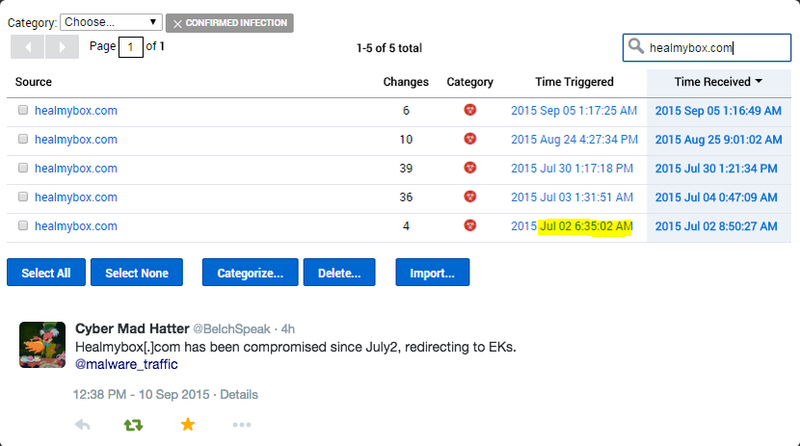 I infected a host the next day on 2015-09-10 by viewing the same website from that Threatglass entry. Saw the same post-infection traffic both times. No ransomware noted like we've been seeing with Angler EK lately, so maybe there's a different actor behind this traffic. Apparently, the compromised website has a history of being compromised. Shown above: Infection chain of events from the Threatglass pcap on 2015-09-09. Shown above: Infection chain of events from my pcap on 2015-09-10. Shown above: Security Onion events seen after using tcpreplay on my pcap from 2015-09-10. Shown above: Some DNS queries for DGA domains seen on malwr.com's analysis of the 2015-09-10 malware.